Each of these writers possesses extraordinary literary skills. Another common tie is their awareness of serving as spokesmen for art to an audience that was mainly indifferent or even hostile. Even though the aesthetic outlook of Pater, Fry, and Bell represents a violent reaction to Ruskin’s moralistic and literary interpretation of art, they were no less concerned than he to overcome the national apathy toward art and to assert its cultural importance. Sir Herbert Read reconciles the oppositions in the work of his predecessors in an aesthetic philosophy that stresses the social and ethnical values of art without sacrificing the idea of individual expression. The major part of Solomon Fishman’s study is an examination of the aesthetic theories embodied in the writings of each critic. 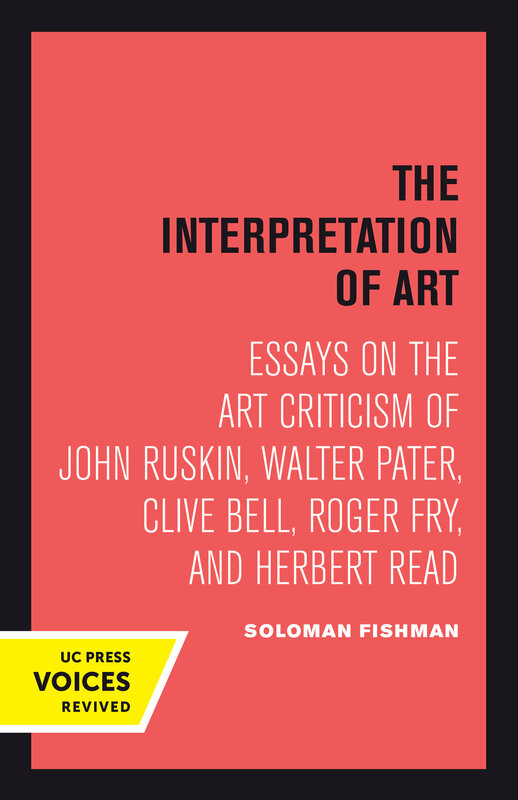 He extracts the theoretical assumptions that form the basis of each writer’s critical practice and traces the development of aesthetic doctrine as it was modified by the critic’s experience of actual works of art. The body of work of these writers is representative of the whole development of modern art criticism and aesthetic theory. Although they display great diversity in ideas and taste, all five critics were instrumental in shaping the response of the public, first of all toward art in general, and finally toward modern art. Their work represents a unified segment of the larger enterprise to understand and illuminate art and will interest anyone who wishes to enlarge their own understanding. This title is part of UC Press's Voices Revived program, which commemorates University of California Press’s mission to seek out and cultivate the brightest minds and give them voice, reach, and impact. Drawing on a backlist dating to 1893, Voices Revived makes high-quality, peer-reviewed scholarship accessible once again using print-on-demand technology. This title was originally published in 1963. Solomon Fishman was Professor of English, University of California, Davis, and the author of The Disinherited of Art: Writer and Background.